What is your best sounding kit? I know a lot of us own multiple kits. Some for practical reasons (drums for different bands and applications) and some of us are simply collectors who cannot resist the urge to score the next deal. Putting brand loyalty, vanity and price tag aside, what is your best sounding kit? I was recently setting up my kits and giving them auditions if you will. Several were great but two stood out. I have a 75th anniversary Premier Genista kit (20,10,12,15, 5.5x14) in white marine pearl and a Sonor beech performer (22,12,13,16) in lipstick red. These kits just sing. Ironically, I only paid around $650 total for both. These beat out DW, Yamaha, Ludwig, Slingerland, Gretsch, Pearl (no Tama at the moment). Of course this is simply my opinion today. Tomorrow may be different. Tough one for me. All my kits are my favorite. Really! But if you put a gun to my head and said I could only have one, my Rogers late 60s Holiday kit. As a bottom feeder,i own no high end kits but out of all 6 kits i do have,it's my BoomTheory,12,15,22,6.5x14 and my Yamaha Stage Customs,12,14fltm,16 fltm,22 or 20. These work great for me. The 20 is single tension tuning and sounds huge and toneful. The 12 was a converted single tension ...also big sound. 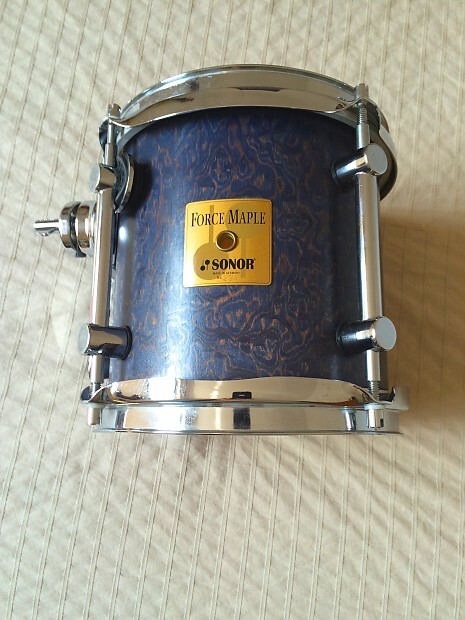 The 14 was a Sonor Force JR Frondelli edged and wrapped for me. I picked up a matching 13 (w/gretsch lugs) and a black 16 w/gretsch lugs. Oh...the kit is an awesome black oyster...I've learned to love the finish. Right now I have two Tamas (Starclassic and old Stagestar) and two Rogers-mix of mid-60s and late 60s. Like Dan, if I had to grab one from a fire it would be my Cleveland\Dayton Holidays "just because". 12, 13, 16, 20, with a '67 COB Powertone. Can't imagine not being happy with that setup for any genre with just a head swap and tuning change. I seriously could not pick between my two favorite kits, so I would grab both if the house were on fire. My DW Collectors Maple 22,8,10,12,14 & my Yamaha RC 10,12,14,20. I would also grab my Ludwig Copperphonic snare! I have a modern kit and a vintage kit that I like equally . TRS Custom Drums 20/12/14 - maple /mahogany shells . I have a vintage 3-ply Slingerland set and a "modern" Nashville era Studio King set. Apples and Oranges. But the modern Slingerland kit is really versatile and sounds pretty incredible! Especially with the Radio King snare drum. This one gets the most playing time of the eleven kits I own. Early 70's three ply clear interiors. My first kit was a Black Cortex three ply. It's the sound I grew up with. Sheesh. An almost impossible question to answer. But, at the moment it's my new-to-me Rogers Dayton-era 22/16/13/12 Londoner kit with COB Powertone. - I forget how long ago I bought these. There are scuffs here and there and the Adonis lugs are showing signs of age but they sound just as good as the day I put them together - of all the kits I've had and have that I use on gigs, this has always been the band members favorite. 2005-6 around there; (new) USA good -ol fashioned'- Gretsch satin gunmetal BKs with vintage WFL Ludwig snares. My best-sounding kit is my Camco Chanute 12/13/16/22. Several were great but two stood out. I have a 75th anniversary Premier Genista kit (20,10,12,15, 5.5x14) in white marine pearl and a Sonor beech performer (22,12,13,16) in lipstick red. These kits just sing. Ironically, I only paid around $650 total for both. These beat out DW, Yamaha, Ludwig, Slingerland, Gretsch, Pearl (no Tama at the moment). I agree on your Genista choice... I had the English made one right next to my Yamaha RC's and the Genista was like what the RC's would be if they were a few notches better. I also had a similar thickness Sonor like you..(probably the best sounding shells I have ever heard) but mine was a German made Force Maple from the early 90's. They rang/resonated so long it just shows they have a unique method because no other thick shells come close. I've had most of them. My Camco Oaklawn bop hands down the best sound set I have ever played . Naturally, I feel like all my sets sound good and each offer something unique - but my Cadeson Royal Custom Studio kit has a richness of warm balanced tone that's quite extraordinary.